Welcome! If you're like most raw feeders, you may be attracted to a raw diet because it's a much more natural alternative to processed pet foods. Luckily, a gently cooked fresh food like NomNomNow also provides the same alternative, with fresh, whole ingredients that are cooked just enough to reduce bacterial concerns, while still preserving the high nutritional value. 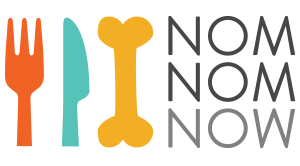 When Dr. Shmalberg began formulating our healthy dog food recipes here at NomNomNow, we chose to gently cook our food rather than serving it raw for a variety of reasons. From a customer prospective, we've worked hard to provide a food with all of the benefits of raw, with none of the risk or inconvenience. There's no defrosting, disinfecting, or portioned needed with NomNomNow. And you don't have to worry about the harms it could potentially pose to your dog. We recently interviewed one of our customers, who switched from a raw diet to NomNomNow, and he walked us through the two types of diets, and the pros and cons of each. You may be interested to hear directly from him what he thought about both: "Why I switched from raw dog food to NomNomNow."